Obtaining a bachelors degree college graduation cap and gown shouldn't be struggle. College cap and gown sets are available for bachelor and career schools. however they are available in most colors as well. Just pick out the color of your graduation gown (the same color will be used for your academic cap) and let us know what color tassel you like. You have the choice of a single color, or a two-tone tassel. The cost of individual cap and gown sets is $48.50 (each). That includes the cap and tassel, graduation gown, and a year date charm that goes on the tassel. If you are ordering multible sets of caps and gowns, please contact our office, to see what discounts may be available. Accessories (graduation gifts) to compliment your graduation gown include honor stoles and honor chords. 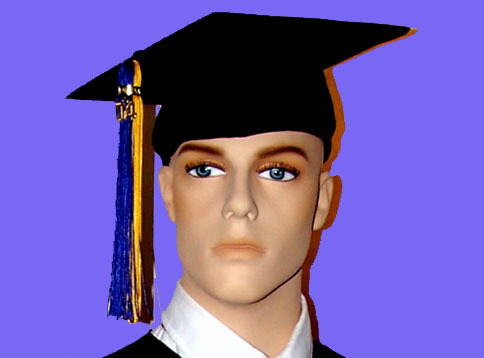 We can also special make "rental quality" caps and gowns (black or in color) upon request, designed for theater, schools that wish to keep their gowns to reuse each year, or faculty members with bachelors degrees. Contact our office for more details. Burgundy and Navy caps and gowns, shown with gold honor chords and honor stoles. When ordering your cap and gowns, please give us your height and weight. We do not need to know the hat size, as we supply each graduate with a one-size-fits-all academic cap, to make fitting into your mortarboard easier and more comfortable. 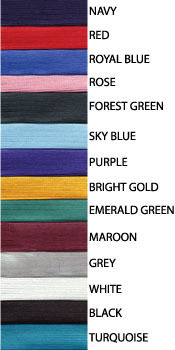 Generally, each school has its own academic colors represented on the lining on the back of a graduation hood. If you desire an academic hood, let us know the name of the school you are graduating from, and where it is located (so we'll know which colors to use), and also the degree you are getting. 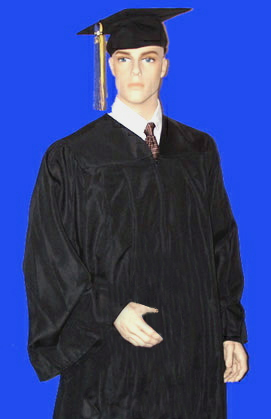 The degree is represented on the velvet portion of the graduation hood. 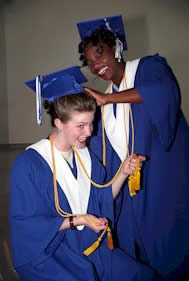 For example, bachelors of arts normally receive white velvet on their graduation hoods; bachelors of education normally receive light blue velvet; bachelors of science normally receive gold velvet.